Fall mums might be the most versatile fall flower, since they come in almost every fall color imaginable. It might be getting colder by the week, but that’s no reason to hang up those gardening gloves for the season. Fall and early winter offer some of the most beautiful colors of the year. All those shades of orange, red, and brown can be incorporated into your landscaping this fall, and might even add a little extra to a house for sale on the market. A key to having a great fall garden is to use the full color palette available. Sure the deep reds and bright oranges are the staples of the season, but add in some green-yellow and even some purple here and there to get the full range. Planting pansies will give you nice reds, while nemesia and English primrose can show off the orange to yellow range. Get some purple in there with ornamental kale, which holds up to the cold well. 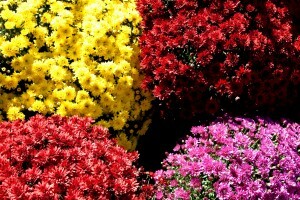 Another great choice are fall mums, which are available in a variety of colors, shapes and sizes. They’re low maintenance, easy to grow and can be kept in containers or grown in beds. Nobody likes a yard covered in browning leaves that looks like it hasn’t been tended to in a few weeks, and it can destroy all of the other work you’ve done. A lawn covered in leaves will keep sunlight from reaching budding grass seed and can nullify the advantages of aerating, too. Don’t forget to work your trees into your color scheme, too. If you have a tree that has a predictable coloring, like red maple, try to steer clear of planting too many flowers of the same color. 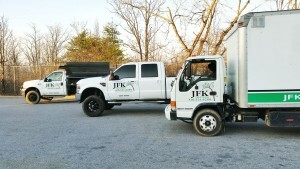 For over 12 years, Jason Kahler and his team at JFK Lawn & Landscaping have been providing outstanding landscaping services to homeowners and businesses throughout Howard County, and recently expanded to Montgomery County and Carroll County. Family owned and operated since 2004, JFK offers services including lawn maintenance, turf enhancement, general landscaping, gutter cleaning, and powerwashing, as well as snow removal services in the winter months. To learn more about what we do, check out our About Us page or our FAQ section. This entry was posted on Monday, October 24th, 2016 at 3:17 pm. Both comments and pings are currently closed.